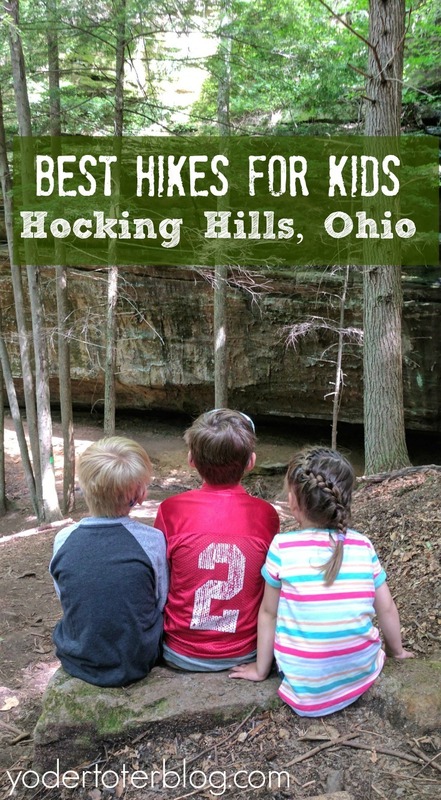 Hocking Hills is the perfect family-friendly Ohio destination. 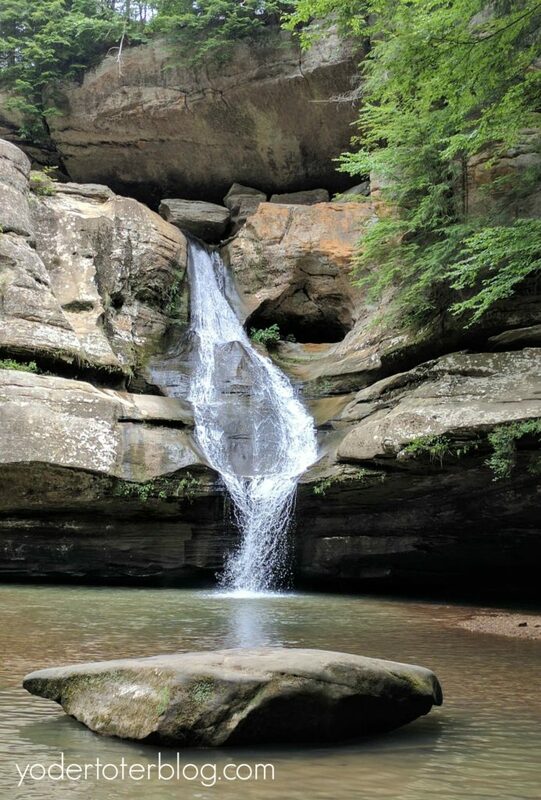 The main attraction of Hocking Hills are her natural rock formations and numerous waterfalls, but all of these must be reached by hiking trails. Over the years, I wished that someone would rank the easiest or best trails for young children. 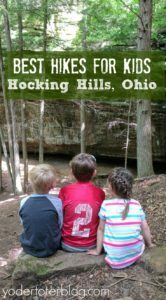 So, after multiple visits to Hocking Hills with our family, I’ve come up with a list of the best hiking trails for kids at Hocking Hills. The easiest hiking trail at Hocking Hills for kids of all ages is the paved Gorge Trail at Ash Cave. This trail is stroller/wheelchair accessible and it’s only 0.3 miles long each way, so if you have young ones that want to walk, but tire out quickly, they should be able to handle the short distance. The trail ends at the large cave recess- Ash Cave stands over 90 feet high and is almost 700 feet wide from end to end, so it’s sure to wow even the littlest traveler. The area is full of sand and the rocks can be slippery, so tennis shoes should be worn. However, on dry days I’ve found Ash Cave to be almost one giant (shallow) sandbox. If you have a little one that likes diggers or trucks, maybe pack a few small ones to give yourself a moment of solitude. Conkles Hollow is a State Nature Preserve within the Hocking Hills area. This is one of the most dramatic areas in the winter, as the walls of the gorge can be filled with ice formations. On one winter visit, my little ones thought we had taken off to Elsa’s land in Frozen. The best trail for kids at Conkles Hollow would be the half-mile Gorge Trail. The Gorge Trail at Conkles Hollow is paved and stroller-friendly, just note that if you do visit in winter, this area does not get a lot of sunshine and you may be walking on a sheet of ice instead of a paved trail! For the most part though, for the summer and fall visitor, this paved trail is without too many hazards for kids to encounter and makes a must-see stop on your Hocking Hills vacation. 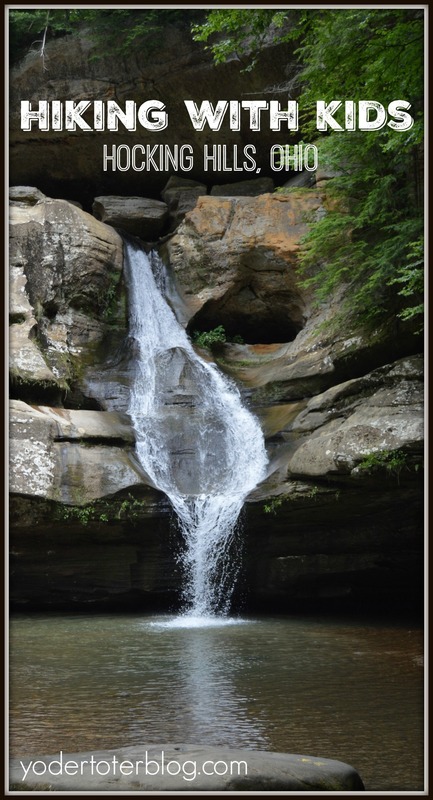 Cedar Falls is one of the most iconic sites at Hocking Hills! For good reason – the waterfall and surroundings are truly magical. There are multiple ways to reach the Cedar Falls and with small children, it’s hard to know which is the best! I recommend parking at the main Cedar Falls parking area (this is not the one right along 374 but instead follow the signs to a stone sign and parking entrance). This trail is NOT stroller friendly, but you do enter the gorge via stairs which for me is easier if holding the hand of a toddler or wearing them in a carrier. I’m less nervous about falling! (Using this map, you’d only hike the portion where the yellow and purple go together and then turn around). Rockbridge is another Nature Preserve within the Hocking Hills area. I had a hard time choosing the between a #4 and #5 for the best hiking trails, but I like Rockbridge because there is very little time in which I HAVE to be holding the hand of my preschooler. The path begins in essentially, a pasture, and then weaves through the woods before coming to Ohio’s largest natural rock bridge. This is the area where you’ll need to be extra careful with young children to ensure they don’t fall. Another reason why I love the Rockbridge is that I’ve never found it to be as busy as Ash Cave or Old Man’s Cave. 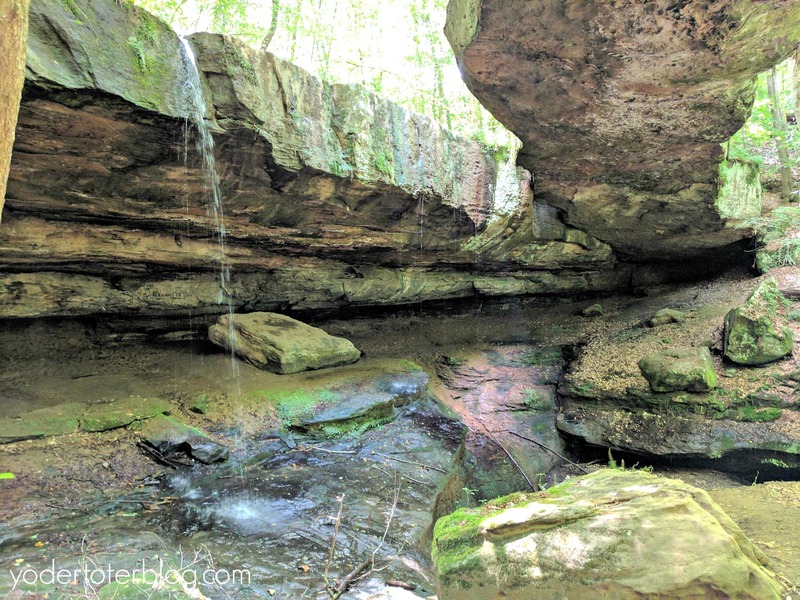 It’s not “off the beaten track” but in the words of a fellow traveler I met on our last visit, “Old Man’s Cave was like an airport terminal.” You’ll find out for yourself. Old Man’s Cave is one of the hallmarks of Hocking Hills. For the most kid-friendly experience, I’d take the stairs down to the bottom of the gorge and get on the blue Grandma Gatewood Trail. This trail allows you to view the main attractions of the Devil’s bathtub and Upper Falls. You will have access to the upper gorge and rim trails, but with younger children, I’d probably just take the stairs back the same way you came down. Have you been to Hocking Hills? Which trail would you recommend as the best for kids? You can learn more about Hocking Hills HERE (i.e. find out why I don’t recommend the Rock House). Looking for a place to stay? Check out the Hocking Hills Caboose. I visited Cedar Falls just the other day and loved it – the waterfall was gorgeous! Next time you go check out the Hocking Hills app, it has these trails and I think even some more as well – helped me a lot. Great post! Awesome! Didn’t know there was an app. I didn’t have mobile service throughout much of the park- will it work without 4G? I didn’t have much service either and it seemed to work fine so I think so! 1. 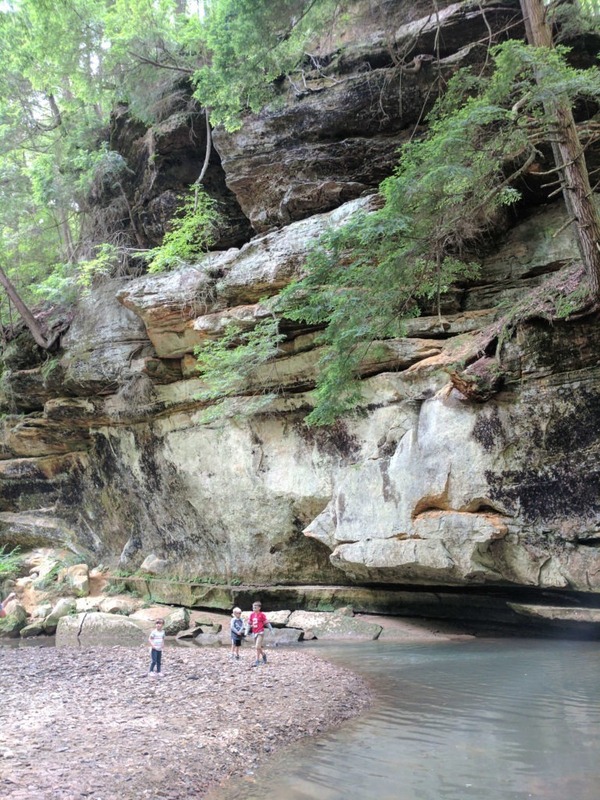 Ash Cave – stroller friendly, easy hike, kid enjoyed playing in the sand, very pretty. Dog friendly and kid friendly. 2. Cedar Falls – not stroller friendly, and stupidly I forgot my carrier, so I had to hold baby in arms, but I managed. It was a beautiful, warm day, and I didn’t know that the kids all play/swim in the water at the base of the falls. So, dress the kiddos in bathing suits!! Wear/bring water friendly shoes if you want. The rocks can be slippery, so my 4 year old got in the water unintentionally, which was pretty funny. As did quite a few adults while we sat on the rocks and watched. Dog friendly. 3. Conkles Hollow – sure wish we had skipped this one. Arrived, unloaded and as we went to enter the paved path saw the NO PETS sign. So, Grandpa had to stay back with the dog while the rest of us went on. That would have been good to know in advance, and the park map provides no indication that no dogs allowed. We did the 1/2 mile walk and then got to a point where the stroller could go no further, yet the main attraction was a short walk ahead with steps. So, baby and I sat and waited while Grandma took 4 year old the rest of the way. No water fall, not the best site on a spring/summer day, if you have to choose. 4. Old Man’s Cave – very pretty. Hardest/most challenging of our 4 hikes, particularly with baby in arms. Really, really wish I had remembered the carrier!!! Dog friendly. Kid friendly, although definitely requires close supervision! Enjoy! We had great weather on Mother’s Day weekend, and it was nice to get out and be with nature at its best. Thanks for your thoughts, Kristi! We don’t have a dog, so I didn’t consider the dog-friendly tips. All in all, it sounds like you had a great trip!